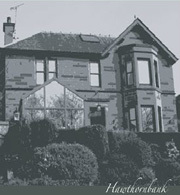 Hawthornbank guest house, bed & breakfast accommodation, is located in Galashiels, Selkirkshire, near Edinburgh. Our guest house in Galashiels is 4 miles from Melrose in the heart of the Scottish Borders, perfect for Golf breaks, and our accommodation is easily accessible from Edinburgh - approx 35 miles, Glasgow and Newcastle are approx 70 miles from Galashiels. Major routes: A1, A68 and A7. Look for directional signs to Galashiels. All rooms in our guest house in the Scottish Borders offer the last word in luxury. Guest rooms are en-suite and are equipped with modern features - wall mounted plasma TV's, Ipod docking stations, WI-FI Internet, hair dryers and straighteners. To ensure you are comfortable during your, stay fluffy white robes and slippers are provided and can be used when using our accommodations exterior hot-tub, or steam massage showers with built in mood lighting effects. We only use the best Egyptian cotton sheets in our guest house, with the option of goose feather or hypo-allergenic duvets and pillows in your accommodation. Guest house facilities also include tea, herbal teas, coffee and fresh bottled water. Complimentary toiletries and fresh flowers. We believe whether your stay at our guest house is business or pleasure - luxury and comfort is paramount. Secure off road parking is available at the guest house. With major Golf courses near accommodation. Hawthornbank guest house can provide the hub of your Golfing break in Galashiels, The Scottish Borders, Scotland. There are many Golf courses in the area and Hawthornbank bed & breakfast guest house accommodation can arrange "Freedom of the Fairways" from Scottish Borders Council - Passes for 3 days & 5 days Golfing, offering access to many of Scotlands wonderful Golf courses. And, as an added bonus, you will find the local Galashiels Golf course is just minutes away from luxurious Hawthornbank guest house.